I see yours was first... apologies but prefer them all in one thread. Junk, don't actually contain any spices. I feel ashamed to have even eaten the disgusting things, tastes more like sugary sweets than curry. I quite like them as they are, & if I want a stronger spicy taste I add some which costs next to nothing depending on where you get your spices from. I get mine in bags from Tesco world food isle or cheaper in bulk from an ethnic store on the rare occasion that I visit a city. Also over half of these are suitable if you have a cows milk allergy. I wont quote them as it's always best to read the label as most manufacturers often change them. Seems a bit silly to criticise for not being as good as cooking your own from scratch with freshly prepared spices - well duh, obviously its not as good. But if you are in a hurry, this Pataks prepared stuff is better than similar products, and a good buy at this price. I used to live in a house over looking the backyard of a very populate Tandoori restaurant - guess what they got delivered every week or two? Yes, catering sized jars of Pataks sauces. All bog standard Tandoori/Indian restaurants do the same, they are there to make money and provide punters with the experience they expect - not to provide top of the line Indian cuisine. You need to live in a city like Leicester to fully appreciate the difference - rule of thumb is that if Indian families don't regularly eat in the restaurant, 99% chance of it being out of a jar. My local Farmfoods in Lincoln had the slightly smaller size 425g on 2 for £1.60 if that's any help to anyone. I'll be honest only just woke up to the world of making your own curry … I'll be honest only just woke up to the world of making your own curry pastes with a mini chopper/processor, takes 10 mins of extra preparation and you get a proper curry at the end, maybe not quite up to the standard of spending a couple of hours with preparation but 10 times better than Pataks/Sharwoods...I feel ashamed to have even eaten the disgusting things, tastes more like sugary sweets than curry. I agree. For th cost of 5 jars of Pataks you could buy this book instead! Seems a bit silly to criticise for not being as good as cooking your own … Seems a bit silly to criticise for not being as good as cooking your own from scratch with freshly prepared spices - well duh, obviously its not as good. But if you are in a hurry, this Pataks prepared stuff is better than similar products, and a good buy at this price.I used to live in a house over looking the backyard of a very populate Tandoori restaurant - guess what they got delivered every week or two? Yes, catering sized jars of Pataks sauces. All bog standard Tandoori/Indian restaurants do the same, they are there to make money and provide punters with the experience they expect - not to provide top of the line Indian cuisine. You need to live in a city like Leicester to fully appreciate the difference - rule of thumb is that if Indian families don't regularly eat in the restaurant, 99% chance of it being out of a jar. It's a hot deal no doubt, but seriously try making your own paste, there's lots of easy recipes to follow. I'm sure there's people out there who make it fresh each time who turn their noses up at the pastes you can make yourself too. Not criticizing deal, I was just genuinely surprised just how much better a paste that takes 10 mins to make is than these jars and works out at a similar price if you make a batch and freeze it, keeps a few months. When you want to use it just chuck it in the pan frozen, add water and cook as you would a jar. I agree with robo a hot deal and voted hot was just additionally adding my opinion. I know this is a quick convinient solution but if you can spare some time have a go at making some might suprise yourself and your tastebuds. Thanks for posting op have forwarded to my non convert sister. Always buy Patak's in cans not the jars, taste much, much nicer and cheaper still. All jar sauces are over sweet and unnaturally glossy. Just an opinion from someone who's been making and eating curries for a long time. I think the book below is probably a better suggestion for the price of just one of these jars, and much less time consuming than following the curry secret. As I say in the thread, I'm not such a big fan of the curry secret but It's probably still worth a purchase. For anyone who is inexperienced but feeling adventurous. Pataks curry paste or similar brand would be a good start. Just follow the instructions on the jar according to personal taste, and add passata (tomatoe puree type stuff) or tinned tomato which is chirpy cheap & nutritious. 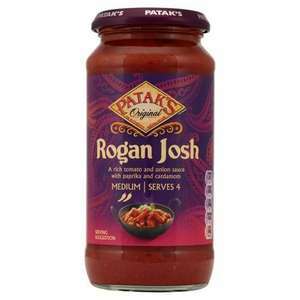 Gives a Rogan Josh type taste. I always add onion, but my rule is add little bits of things you like. For me banana or pineapple go well. Experiment or MadeInBeats suggested book looks good. PS I am not a chef but in my experience that is a good thing especially if you are health concious. If you see a paste called Minara brand, pick these up, they're probably the best pastes I've had. You see them quite a lot in Asda and Tesco these days. For the tinned Patak curry, they are in-between a sauce and a paste so I normally add a onion tomatoes blend to them too. I hate most sauces out of jars myself, pasta sauces especially, they're just so loaded with crap like sugar salt and preservatives and taste uninspiring . The cans of Patak's, you instantly notice the difference and are always in places like Home Bargains and B&M Bargains around the 30 to 50p mark. Repeating what M_z said, most takeaways do buy pre-made pastes, then just add sugar/MSG/thickener. I agree jarred sauces can be horrible, but there are some exceptions; Meena sauces (the 'premium' Pataks) is the closest I've tasted to 'authentic', also Uncle Ben's used to make one which had a paste and sauce which was very good but I don't think is made any more. Cooperative's own brand curry is pretty damn good as well, they have a very hot Karahi which blew my head off. Plus their Naan bread is awesome as well! Has anybody got some recipes to make a good curry paste that they would like to share. I disagree with the theory that 'most' takeaways use Patak's pastes, I'm sure it happens, but saying most is probably a bit exaggerated. Tip though, you could add a teaspoon of say, Tandoori paste into your own when cooking it for extra depth, or something I often do is add a teaspoon of pickle or chukney of your choice. If it's a Vindaloo, I add a teaspoon of ginger&garlic paste about 2 to 3 minutes towards the end which is just heavenly... try it.. The following is video is one of the simplest and.best curries I've ever made. The only spice in it is turmeric but don't let that put you off, you simply must give it a go. even better when you find diced pork in the reduced section for 50p.